If your child is getting too big for the cot, it’s time to transition them into a big bed. They have begun their lives in their cot, so it can be a challenge to convince them to move (and sleep!) in a new bed. With this in mind, The Upside News spoke with Adelaide parents to find you the best advice on helping your child move from the cot to the big bed. Seth enjoys stretching out in his big bed. “Also, be consistent when it comes to grandparents and babysitters; if you have your child in a bed at home, make sure they are in a bed at other places they stay,” Jenni said. Lia from Seaford reckons a tough approach is best. “Be firm. Take the cot away and replace it with a bed,” she said. “Decorate the bed with bed linen and a new pillow with their favourite character on it. Give them a matching night light to assure them they are safe,” Lia said. Nikki from Morphett Vale said putting a mattress or trundle next to the bed kept her son safe during his transition. Jack and Nate hang out in Nate’s cot. She had a cot with a removable rail so Jack was still in his cot where he was comfortable, but the mattress helped to move him to a big bed. “I put a mattress next to it in case he fell out. Then after a week or two, I suggested he sleep on the mattress on the floor for fun with his favourite teddies. Once he liked sleeping on the mattress we disabled his cot together and put up his new big boy bed as a team to make it so fun so; he was excited to sleep in it. He was used to the feel of the mattress it wasn’t so new. Only the frame was different,” Nikki said. Transitioning into a bed is a rites of passage moment for kids. Matthew from Kurralta Park said. Kids love to feel that they are growing up, “If they see moving into the big bed as a sign of becoming a big kid, they will be more enthusiastic,” he said. “Let them take ownership of the process so it is a part of their transition into the next stage of their life. Maintain other routines like bed times and their settling routine to improve the experience. Be careful about the move coinciding with the arrival of a younger sibling so it doesn’t look like the baby is the reason the cot is being taken away. It’s better to make the move a month or two before the baby arrives,” Matthew said. But through any transition in your child’s life, safety is paramount, according to Melissa Abalo from Homesafe Kids. 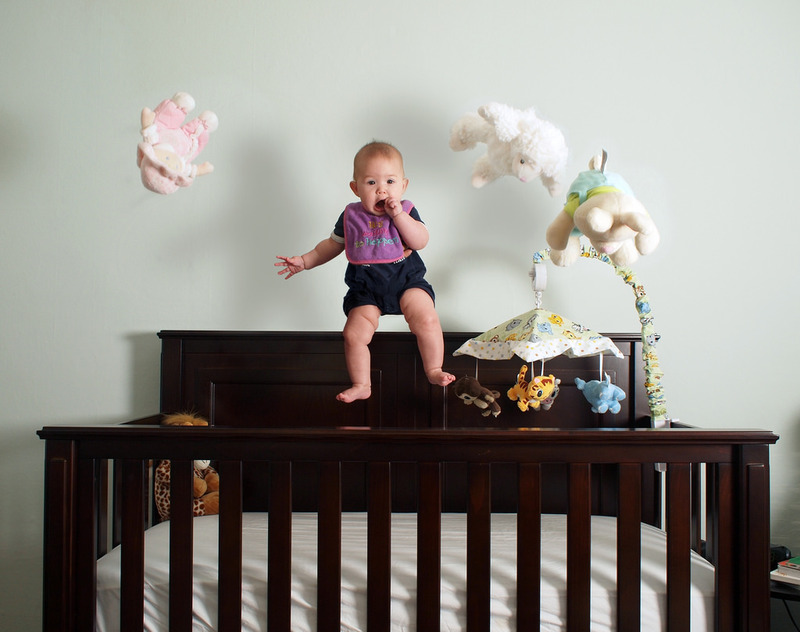 Keep your child’s cot or bed free of toys,like Austin’s crib. “To make sure the child is safe and comfortable, we recommend keeping the bed as free of ‘junk’ as possible. The less soft toys, the better! Also make sure the child cannot suffocate due to excess blankets (keep bedding as light as possible), and tie up all nearby curtain cords to avoid the child getting caught up in the strings and strangling themselves,” she said. You can close the door or keep it open, depending on what you’re comfortable with, but Melissa says the main thing is to ensure that there is adequate ventilation. Both parents and child must be comfortable with the transition so go at your own pace and try to enjoy the experience together. The time will come when yourchild has grown out of the cot. Would you like a blog post like this for your website? Contact Expressions Media to find out how we can write for you.